Here at K Dental Studios, we understand that parenthood brings a lot of responsibility and there’s always a lot to learn. Your child’s health, both oral and general, can be influenced by your actions. So we wanted to share some top tips with you to help you give your children the best chance in maintaining a good level of oral health throughout their childhood and beyond. Your children’s teeth may start appearing when they are around 6 months old, but the care must begin before this. Fluoride toothpaste can help to protect your children’s teeth. Your dentist will tell you the best time to introduce this to suit your child’s oral development. They will also advise you on the strength of fluoride which should be used. It goes without saying that brushing twice a day is vitally important in ensuring good oral health. As with anything, habits that are established at a young age are likely to stick and looking after your teeth is a great habit to have. We also find that it’s beneficial to introduce your child to their dentist at a young age as it eliminates the opportunity to build up a phobia of the dentist. We would also recommend telling your child in advance that their milk teeth will fall out so that they are prepared for it. We find reminding them that they will get nice, shiny grown-up teeth soon has them smiling. How do I brush my children’s teeth? It may sound simple, and it is, but there’s a couple of things that will help you educate your child whilst you brush. Firstly, we would advise choosing a spot in front of a mirror which becomes known to your child as the place to brush their teeth. The mirror will allow them to see exactly how it should be done, whilst an associated place will help to create the habit. Although your child should hold the brush themselves (once old-enough), you should guide the positioning of the brush with their hand so they can feel the movement. It’s also a good idea to set an egg timer so they can countdown and achieve a good two minutes of cleaning each session. Finally, always supervise. When they begin to brush on their own they may develop bad brushing techniques or rush. If this goes unnoticed and becomes a habit, it’s hard to undo. We know that brushing your teeth isn’t the most exciting experience for children, especially when there’s so much fun to be had elsewhere. As parents, you should try to make the experience as enjoyable as possible whilst still remaining safe (running around with a toothbrush in your mouth won’t end well). Brushing your own teeth at the same time will often make it a little more fun from your child’s perspective whilst helping to instil a routine. We try to encourage parents to show children the correct brushing technique. In the early stages when the baby teeth are still present we understand that children will not be able to achieve a similar standard of brushing. The aim at this stage is simply for your child to understand the routine as opposed to getting the technique completely correct. As a parent, it’s important not to get disheartened if your child does not get their technique absolutely right at this stage; it will take time. When a child visits the practice for the first time, we’ll do our very best to make them feel welcome. 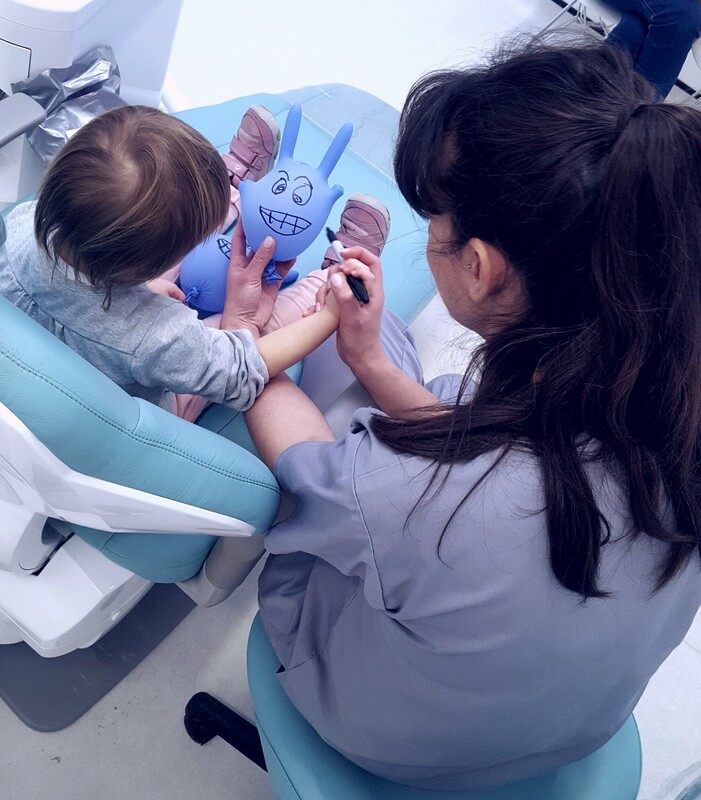 In the past we’ve made blow up bunnies from gloves, drawn treasure maps…anything to ensure that our younger patients can maintain a good level of oral health. We also take the time to explain everything to the parents and offer advice wherever necessary. We’re on a mission to raise the standards of oral health throughout our community, and this includes children. We regularly visit schools and hold oral health awareness talks, which not only are great fun but also help children understand the importance of looking after their teeth and gums. Twice a year, in the school holidays,we hold ‘Children’s Week’, which allows U18’s to have a checkup completely free of charge. However outside of this time, we’ve kept children’s check-up costs at a reasonable price of just £20, so every child can access the dental care they deserve. If you would like to book an appointment for your child or you would like to visit the practice yourself, please call us on 0207 637 8484. We look forward to seeing you.